A leading water re-use company has turned kilometres into pounds and donated funds to a charity which encourages people to walk and cycle. During the first half of 2017, employees from Worcester-based Aquabio notched up an impressive 17,707 kilometres, raising £442.70 for cycling charity Sustrans. 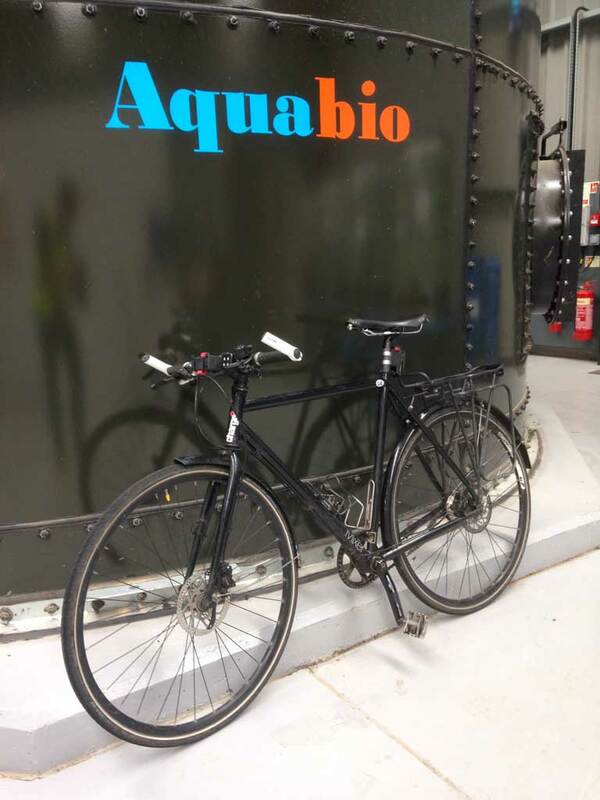 This is the first payment from Aquabio since the company instigated a cycle to work scheme as part of a wider social responsibility campaign. The company set up the scheme called Sustainability and Health in Future Transport – or SHIFT – to encourage its employees to log their kilometres with Strava while cycling to work and for leisure; for every kilometre cycled, Aquabio donates 2.5 pence to Sustrans. Sustrans is the charity that helps more people to walk and cycle. From building cycling routes – The National Cycle Network – to working with communities, encouraging children to cycle and scooter, helping more people to commute daily by bike as well as working to influence government policy, Sustrans works across the UK in a multitude of ways. Strava Insights for the UK show that in 2016 an average of 223,376 commutes were uploaded to Strava every week, with cyclists logging an average distance of 13.5km and an average of 35 minutes in the saddle. Last year, the first ever Strava Challenge to ride to work saw a total of 79,879 cycling commute activities logged on Strava across 180 countries; as a result, 514.51 tonnes of carbon emissions were offset on the day. Dan Brothwell, Development and Operations Manager at Aquabio said : “We are absolutely delighted to be able to make such an impressive first donation to a charity that so many of our employees support. Their contribution in reducing emissions is impressive too; using average figures – issued by the RAC – for a new car of 121.4 g CO2/km, this equates to a saving of 2150 kg of CO2. The benefits of choosing to use a bike to travel as opposed to a car are clear, from physical and mental health benefits to the individual, to reducing carbon footprint and improving air quality by taking cars off the road. The SHIFT scheme provides that extra incentive to individuals, in that by making a journey on a bicycle the company will be contributing to improve cycling infrastructure. Julian Hall is Director of Fundraising and Retail at Sustrans, the UK walking and cycling charity which is celebrating its 40th anniversary this year.